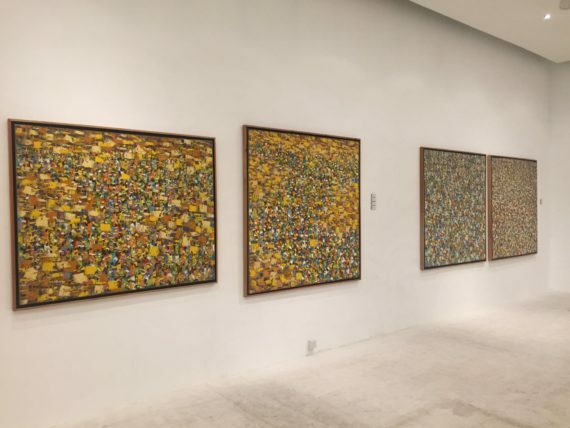 A reflective exhibition of works characterized by repetitive patterns by Ghanaian modernist painter Prof. Ablade Glover that span a period of three decades, is currently on display at Gallery 1957 in Accra. 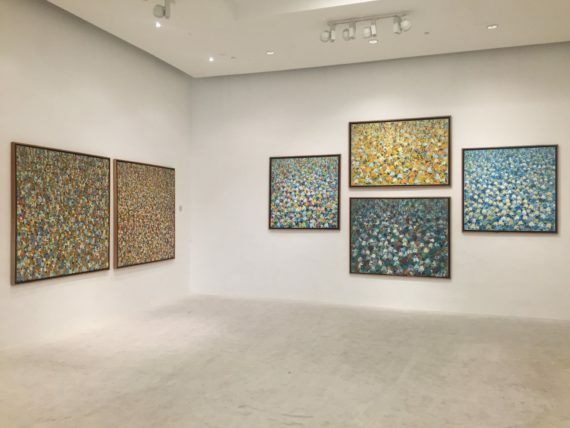 The exhibition, which marks his 85th birthday, is the most comprehensive presentation of Glover’s career to date – showcasing over 50 prolific pieces from the 1970s – that range from his best known pieces, rarely seen paintings to a new body of work. 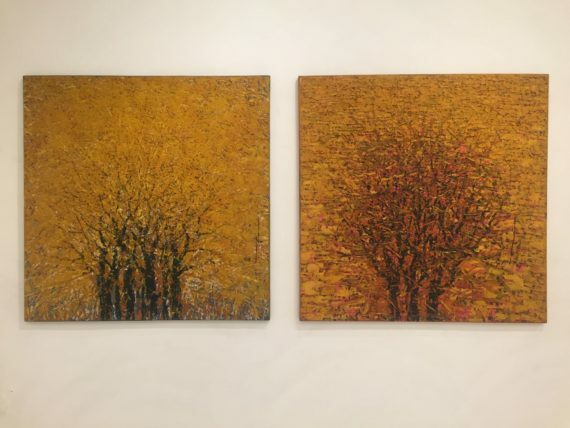 Despite the absence of some his earlier works owing to the inability of collectors to release them, the exhibition provides a rather realistic and factual spectrum of his paintings, which are noted for their accumulation of weight through a symphony of repetitions. Employing his skills as an artist and intelligence as a scholar, Glover developed his style and approach over time, which he used in addressing shifting concerns and new audiences including education and nation building, which constantly reflect in his work. 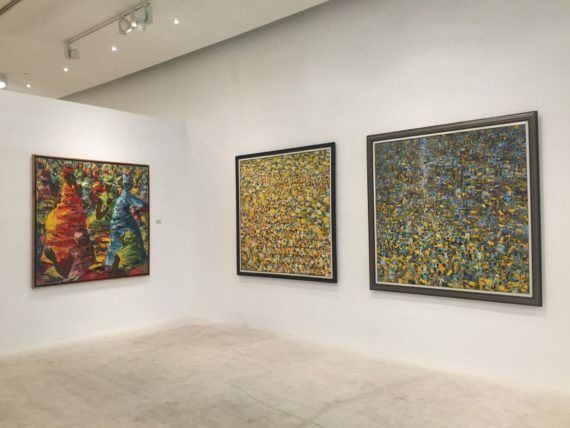 A respected academic, philosopher and nationalist, his works are characterized by an application of thick paint, huge crowds and movement that tend to reflect the heat of the African sun while throbbing with a true sense of colour, texture and vibrancy. 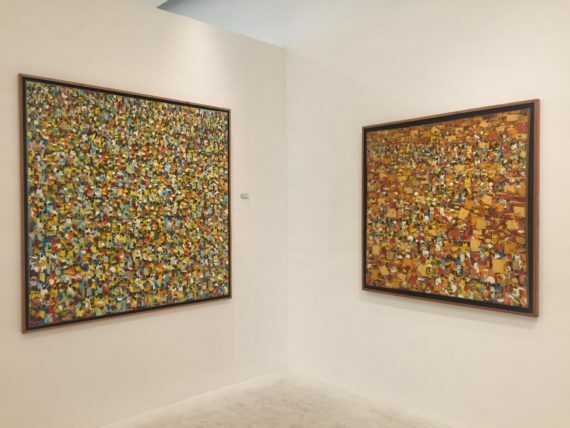 Indeed, he converts the instinctive vitality and organized chaos of African markets into abstract fields of color alongside fleeting details of people, products and human activity while effectively reducing them to flashes of red, yellow and black. A former Dean of the then College of Art, Kwame Nkrumah University of Science and Technology (Kumasi), his works fall into a number of categories including profiles, people, markets, social commentaries, “townscapes”, “forestscapes”, “beachscapes”, “prayerscapes”, “slumscapes”, trotro stations and all manner of celebrations. 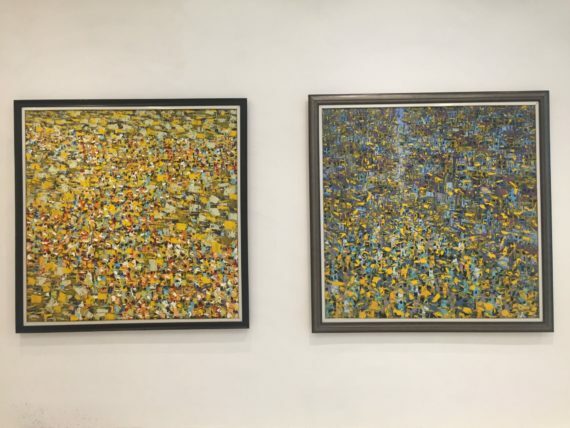 Currently the director of Artists Alliance Gallery in Accra, he has exhibited extensively in West Africa, Europe, Japan and the United States. A recipient of the distinguished AFGRAD Alumni Award by the African-American Institute in New York (USA), he is also a Life Fellow of the Royal Society of Art in London (UK). 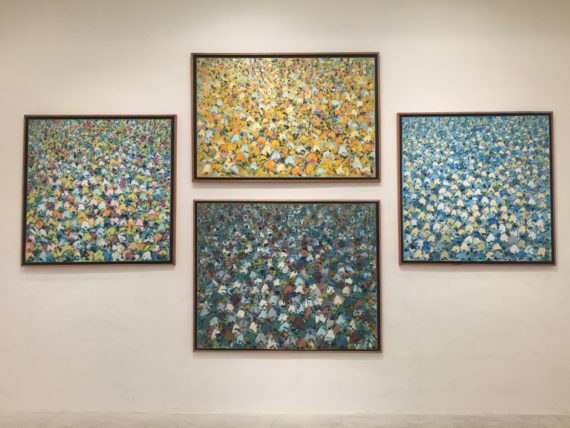 His work can be found in both public and private collections worldwide. These include the Imperial Palace Collection (Japan), UNESCO Headquarters (France) and Chicago’s O’Hare International Airport (United States) amongst others. Others are African American Institute Head Office (USA), Africa Centre, Barclays Bank, Visiting Arts (United Kingdom), Ohio State University International House (USA), Anglogold Ashanti, Ghana Museums & Monuments Board and Standard Chartered Bank (Ghana). 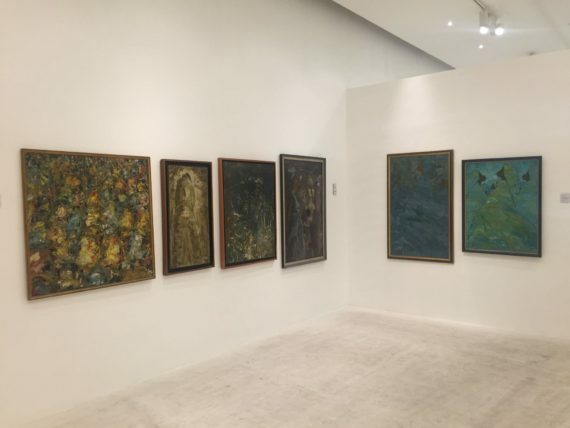 The rest are National Gallery of Modern Art (Nigeria), National Gallery of Zimbabwe (Zimbabwe), UNESCO Headquarters (France), Guy Pas Collection (Switzerland), Commonwealth Foundation (United Kingdom), Royal Collection of Prince and Princess Takamado (Japan) among others. 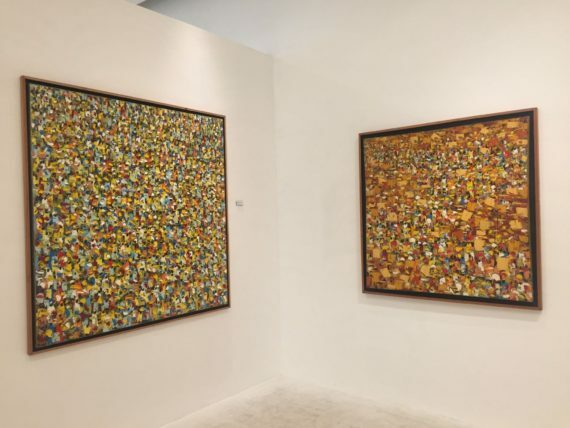 Artists Alliance Gallery has been instrumental in bringing to worldwide attention traditional and contemporary African Art. Its mission is to provide a source for rich and authentic contemporary and traditional African art for the art connoisseurs and art services of superior value. 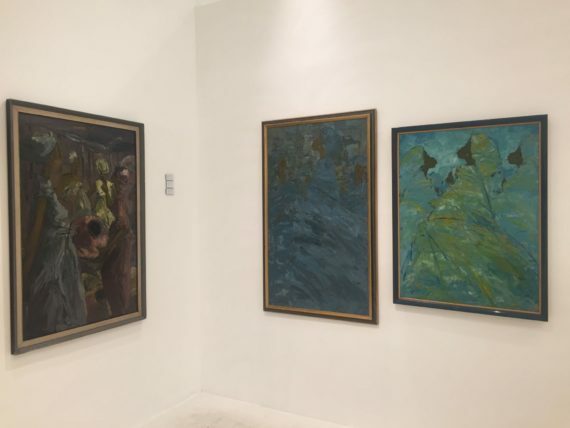 The exhibition ends on Wednesday February 27, 2019.